Whilst shopping around, ODM Staff found this cool promo trolley bag in Carrefour, Zhuhai! A GWP promo trolley bag offered as a gift with purchase promotion. You are entitled to get Unilever branded promo trolley bag as soon as your consumption amount of Dove shampoo reach ￥88 entirely. Basically the trolley case is worthy at least ￥35. How does the GWP promo trolley bag work for your promotion? 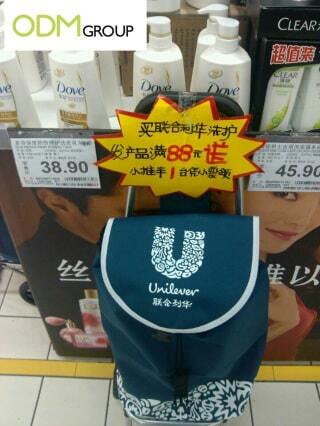 This promo trolley bag is a blue pantone matched color according to Unilever´s branding. This type of promo trolley bag is perfect for any traveler, avid shopper because it is so easy to pack all the goods and essentials inside, which is very popular in China nowadays. Whenever consumers see the special offer in the supermarket coming up with the promo trolley bag which would be needed for daily life, they are more inclined to purchase a daily life product shampoo. A travel bag is actually a really functional gift with purchase for your customers. Especially if your product is catered towards a larger audience with not much preference towards either age or gender. The promo trolley bag woks for all ages. Imaging how useful this trolley bag will be in your daily life such as shopping! The branded promotional product adds high value to the GWP promo trolley bag, making it a high end merchandise. Wherever consumer could carry the trolley bag would act as a form of marketing and advertising for your business as the logo is significantly displayed. Your brand on the promotional product being carried would it would amplify their marketing efforts as it heightens brand recall in the long haul.